There’s a Chinese proverb that states, “If you want to be happy for a lifetime, be a gardener.” We think this statement is absolutely spot on. There’s nothing quite as satisfying as getting your hands in dirt and growing something beautiful or delicious from it. But, we do recognize that not everyone thinks the same way. Some look at gardening like an insurmountable chore (the weeds never stop growing!). That’s why Ragan & Massey has spent the last 25 years developing and perfecting products that make a gardener’s life easier, while making your yard and property more comfortable and beautiful. Here are the five essential Ragan & Massey products every home gardener should have. When you need to conquer harmful insects, indoors and out, you need Compare N’ Save Indoor/Outdoor. 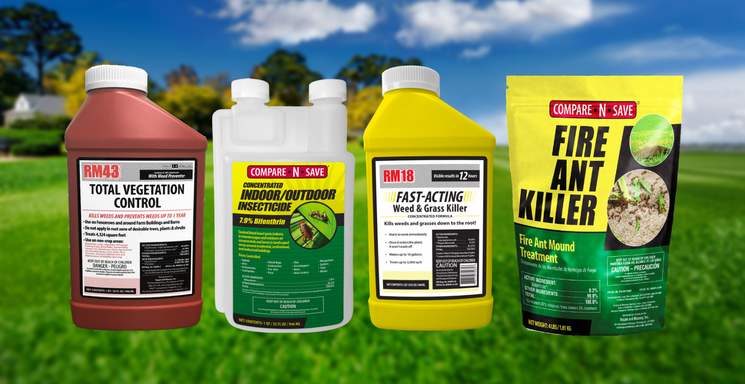 It protects interiorscapes, ornamentals and lawns from a wide range of pests, including: ants, aphids, armyworms, centipedes, chinch bugs, cockroaches, fire ants, fleas, flies, grasshoppers, mites, mole crickets, mosquitoes, scorpions, spiders, ticks and wasps. Compare N’ Save Indoor/Outdoor Insecticide can be applied to trees, shrubs, foliage plants, flowers and nonbearing fruit and nut trees. It’s also perfect for use under concrete slabs and spot, crack and crevice treatment. This product can be applied indoors as well. Just make sure to cover all food, food processing surfaces and utensils. RM18 is the solution for fast, total weed control with minimal prep. This is the product to use when you are replacing a lawn, clearing a walkway or leveling weeds along fence lines, buildings and roadsides. Plus, RM18 only kills the plant – leaving the fertile soil intact; it deactivates after it touches the ground. It kills more than 100 weeds on contact, including: kudzu, wild blackberry, poison ivy, poison oak, crabgrass and dandelions. It is also rain-fast in 30 minutes and effective for up to six months. Fire ants can be a real pain, literally. Stings from these pests are painful but they are no match for Compare N’ Save Fire Ant Killer. This granular product is applied directly to the creatures’ mound. When mixed with water, the insecticide flows into the mound’s tunnels. Apply the product in cool weather (early morning or late evening) and say goodbye to these pesky problems. Compare N’ Save Fire Ant Killer can also be used on plants, interior plantscapes, ornamental gardens or parks, and lawns or grounds. If you’ve got a pond, you need Farmworks Aquatic Herbicide. It is a broad-spectrum, post-emergent weed killer. That means it kills several different varieties of already-growing aquatic weeds. It can clear your pond of cattails, alligator weed, beachgrass, giant reds and several other invasive plants that are growing above the water’s surface. Besides ponds, it can be used in lakes, streams, rivers, canals, wastewater treatment facilities, creeks, reservoirs, rice levees and drainage ditches. It works best when applied during a several days of calm, sunny weather. All of these products can be found on our website, including information on where to purchase them. Keep these five products in your gardening arsenal and make what was once a chore, a pleasure.